There are many various city centers. Some produce a characteristic skyline with alternating towers and other iconic forms. In that sense the very physical centre of Willemstad on the island of Curaçao also has a characterictic skyline with alternating towers…. from the oil rafinery. 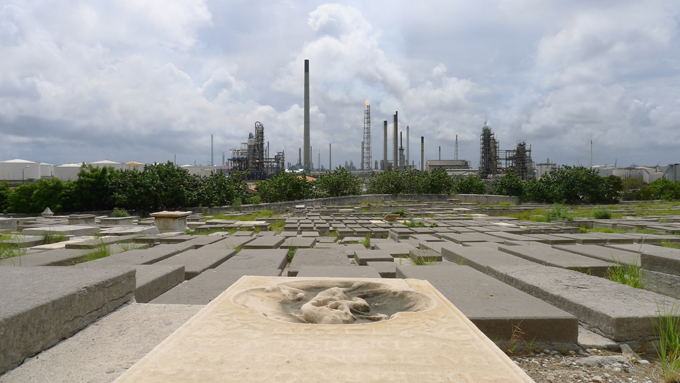 The land once belonging to the Jewish graveyard was sold to the petrol company, to be resold for a gulden. In the course of time the city grew completing a ring around the center. Until so far this would be the only place we know with an oil rafinery at it’s core.